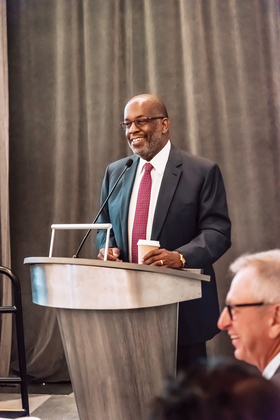 Bernard J. Tyson, chairman and CEO of Kaiser Permanente, delivers the closing keynote address during Modern Healthcare's second annual Leadership Symposium Oct. 19-20 in Paradise Valley, Ariz. This commentary is based on his remarks. The American healthcare industry has a strong foundation of stability and success. At the same time, today's complex world presents great opportunities for our industry to build on the progress we've made and envision what's needed for the future of healthcare. People are living longer lives with chronic diseases, and we've experienced breakthroughs in innovative medical procedures. Precision medicine, genomics and medicines that cure what used to be lifetime diseases are also contributing to people living longer lives. So how do we take the best we have to offer and collectively redesign the healthcare ecosystem for the 21st century? And how can we contribute to the health of people who will live to be 100 years old and counting, based on future life spans? One important opportunity is to envision a system built around "health." We believe that we can extend the investment in health by moving upstream toward maximizing healthy life years. With early detection of pre-chronic symptoms—and early diagnosis and treatment—we can manage chronic illnesses more effectively while building a more economically viable system focused on affordability. Our industry is built to support episodic care. Of course, critical and complex care will remain as vital to our future as it is to our business model today. Still, by focusing on upstream investments, we can help individuals live longer, more productive and healthier lives. This future health ecosystem must extend beyond medical care and influence how we think about community health as well. What are the critical components necessary for creating community infrastructures to deliver equitable health outcomes? We must focus on safe schools and neighborhoods, the availability of healthy food choices, well-funded safety-net organizations, as well as how our industry can help people eat better, sleep longer and manage their mental health and wellness in a 24/7, technology-connected world. Today, technology touches every part of our daily lives. With our smartphones being an integral part of daily life, we can deliver care without requiring people to set foot in a hospital or medical office. While we are always available for in-person care, we can consult with and monitor people remotely to provide care and intervene earlier if necessary. While technology will never replace the importance of the human touch, there is no question it can augment care in new ways today and in our collective future. For the healthcare industry to make significant contributions to healthy lives, we also must look at improving health coverage. Access to high-quality and affordable care remains of critical importance. We still must work toward affordable coverage and universal access for everyone, but a single-payer system is not the only option to achieve this. Fundamentally, healthcare must be more affordable from the perspective of consumers, employers and the government. The current fee-for-service system impedes progress toward greater affordability in healthcare. We must agree to standardized definitions in healthcare and align around quality, service, safety and outcomes—criteria that have become embedded in other industries that have undergone similar transformations. People will live even longer, and quality of life will improve because of our contributions. We have an incredible opportunity to redesign the entire healthcare system around people who will be living to 100 or longer and enjoying active and amazing lives. We have the opportunity to transform the healthcare system for today and for the decades ahead. We can build from what has evolved over the past century, but there is no question there is great upside in creating a more efficient, affordable and relevant health system for the 21st century.